Bayou People (BP) Voices is a collection of video profiles of leaders from coastal communities that have been directly impacted by the BP oil disaster. These community leaders have been working for years to bring justice and sustainability to their families, their neighbors, and the ecosystems of the Gulf Coast. These videos were created by Bridge the Gulf in partnership with the Gulf Coast Fund for Community Renewal and Ecological Health. Wilma Subra is a chemist from coastal Louisiana who has put her expertise to work helping environmental justice communities. She is the recipient of a MacArthur Genius award, an advisor to the Gulf Coast Fund for Community Renewal and Ecological Health and Technical Advisor to the Louisiana Environmental Action Network. In 2011 she will receive the Global Exchange Human Rights Award. Rosina Philippe is a lifetime resident of coastal Louisiana and a member of the Atakapa-Ishak tribe and an advocate for preservation of traditional cultural practices, as well as of the ecosystems that support them. For many years Rosina has partnered with leaders from other communities, along with faith-based and non-profit organizations, to work for sustainability of rural communities and traditional family fishers. Her work focuses on racial justice, economic sustainability, and coastal restoration/preservation. 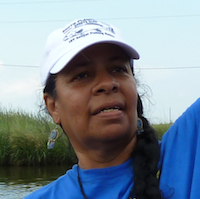 Tracy Kuhns is founder and executive director of Louisiana Bayoukeeper in Barataria, LA. A member of the national Waterkeeper Alliance, the mission of Louisiana Bayoukeeper is to engage and activate coastal communities for the purpose of promoting sustainable management of Louisiana’s Bayou Country and its natural resources for the benefit of all citizens. Tracy, a shrimper, mother of 5 and grandmother of 17, is dedicated to protecting and preserving the natural resources, traditional coastal fishing life and communities of coastal Louisiana. 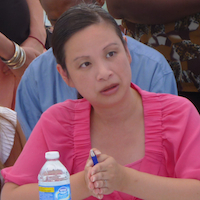 Thao Vu is a counselor at Mercy Housing and Human Development in Gulfport, Mississippi. She is also advisor to the Gulf Coast Fund for Community Renewal and Ecological Health, and member of Mississippi Coalition for Vietnamese American Fisherfolk and Families. Thao has been a leader in advocating for and supporting the Vietnamese community in and around Gulfport, Mississippi, which has been deeply impacted by the BP oil disaster. 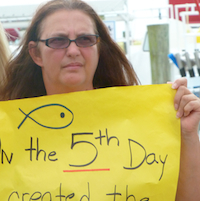 Lora Ann grew up on the water in coastal Louisiana fishing with her parents and grandparents. 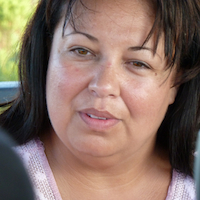 She currently serves as a Tribal Council Woman representing over 900 council members. She has worked for the Inter-Tribal Council of Louisiana and Institute for Indian Development for the past 14 years implementing Native American Employment and Training Programs. Lora Ann cares deeply about sustaining the culture of the Houma people and has worked for 20 years with tribal youth as a leader and educator. She is a co-founder of the Bayou Eagles Native American Dance Group and teaches and demonstrates her skill as a Houma basket weaver and traditional cook. Andre Gaines, who worked to clean up the BP oil disaster, speaking at a rally in front of BP's lobbying headquarters in Washington, D.C.